[mrgreen] Many people are infatuated with space and have been for quite some time. This is what ultimately led to space travel, the discovery of universal expansion, and it even helped us with modern conveniences like the Internet and GPS tracking. One of space’s most exciting natural phenomena is a supernova, the act of a star burning out and exploding. 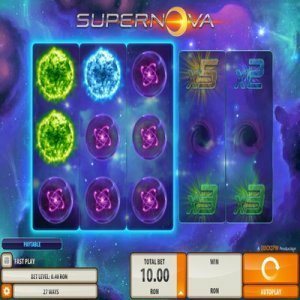 For fans of this type of topic, you may really appreciate the Supernova online video slot machine. It has a cool, unique theme, some stellar graphics, and an original layout that can easily multiply your wins quickly. When you first look at Supernova, it may be a bit confusing. This is a 3-reel, 27-payline slot machine that is configured in a strange 5-reel fashion. That is to say, what you see on the center of the screen are the game’s three main reels, but over to the right side you will find two other reels. They might seem out of place at first, and a bit odd to look at, but you will grow to love them once you find out what they do. When you hit a winning combo with the 3-reel setup, the other two reels act as multipliers and spin to give you more money! This is a very cool feature that can turn any basic win into a lucrative payday. Other than that, this game is surprisingly low on features. Yeah, this definitely counts as a negative against Supernova, but it in no way disqualifies it from being a fun game. The fact of the matter is that having two constantly spinning multiplier reels really makes up for not having a bonus or much in the way of free spins. After all, you don’t have to get lucky to hit a certain symbol on X reel to win a multiplied bet. Your multipliers are always there for you, always active, and frequently landing on something that will increase your winnings. And with 27 paylines, there are quite a few ways to win with Supernova. The betting options are actually quite good considering that the game is pretty basic in the realm of bonus features. You can choose to bet on the lines, easily adjust the amount of money you want to bet, and even use an autoplay feature to let the game coast on cruise control. You also have a varied range of coin sizes to use. You can bet anywhere from 0.25 to 50. However, the max jackpot is really low for a lot machine, only paying out $1,000. Supernova is a slot machine that may not appeal to a very wide base. However, it is a very unique machine that can end up paying off for you in a big way. By having the multiplier constantly supplying you with a potential bonus, any little win can instantly become a big win. That’s more than enough incentive for many slots players.